Have a casual meal with this K&B Pub set featuring a table and two (2) stools. Scaled to fit into smaller spaces or cozy nooks in larger rooms, this pub set is perfect for any home. 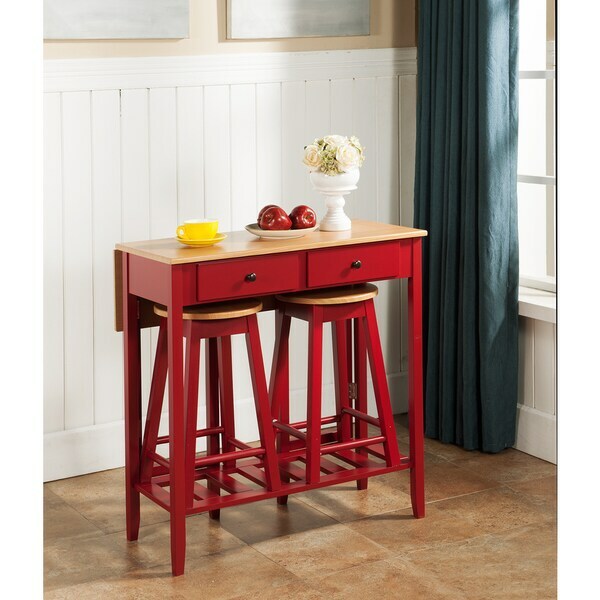 The red finish is enhanced by a light brown table and stool topper that will complement your kitchen decor. This set is perfect in size for our needs. However, it's make cheaply. First night, a quest was eating chili w/me. When taking up the dish, we noticed the "wood" was rippled. Looks like they used cheap wall paper to cover whatever is underneath. Very disappointed. I'm so thrilled with this extra seating that this piece has the possibility of if you would like to open it all the way! I also love having two drawers on it, I'm a storage fanatic! I love how compact and CUTE! This was easy to assemble but it is more decorative than utilitarian. It is flimsy not solid. It's an overpriced "cute" product that was not the right choice for use in my kitchen. It's like something that would be sold in an LTD catalog. It’s adorable, but tiny. We have a small dining area so I thought it’d be perfect but it’s a little small. I love it for another room we have though! It’ll definitely be used. Perfect touch for apartment! Easy to assemble &amp; well made! Very pleased, color is true to description, fits nicely in a corner, using it for crafts. Easy to put together. Cute. Just what I needed for my small space. "Can I use this as an entryway table?" "What is the size of the table when it is fully extended?" "What is the width, (left to right), and the depth of the table top (front to back) when the leaf portion of the table is down? Thank you, Glen"
It measures 31.75 w x 15.5 d x 33 h (inches). "What is involved in the assembly? Thank you." The assembly is pretty tedious, I would definitely recommend it but to someone with patience to put it together. My father came to my home and it took him about 40 minutes, and just for reference he was a construction employee before retirement. We will be downloading the assembly instructions shortly. Please check back with us. "what is the likely hood of that red pub table being in supply again?" Hello vanleigh, items are restocked as they become available; however, we cannot guarantee an item will be restocked. Please enter your email address on the product page and we will notify you if it comes back in stock. Thank you for shopping with us. "Is there a way to order two stools in addition to the table and stools that come together in the 3-piece set? Please let me know." Hello scohn, we do apologize, the stools are not sold separately. Thank you for shopping with us.